Somewhat Seedy Garlicky Toasted Bites - 5 oz. VEGAN, CRISPY, ORIGINAL & HANDMADE WITH LOVE. 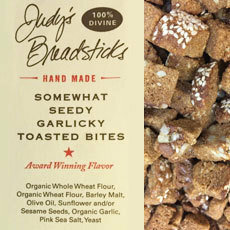 INGREDIENTS: Organic Whole Wheat Flour, Organic Wheat Flour, Barley Malt, Olive Oil, Sunflower & or Sesame Seeds, Garlic, Sea Salt, Yeast. Fabulous snack food or in soup, salad or pasta to add crunch and flavor.